Many people are surprised when they read "The Art of Convening" book and learn about the Convening Wheel model. 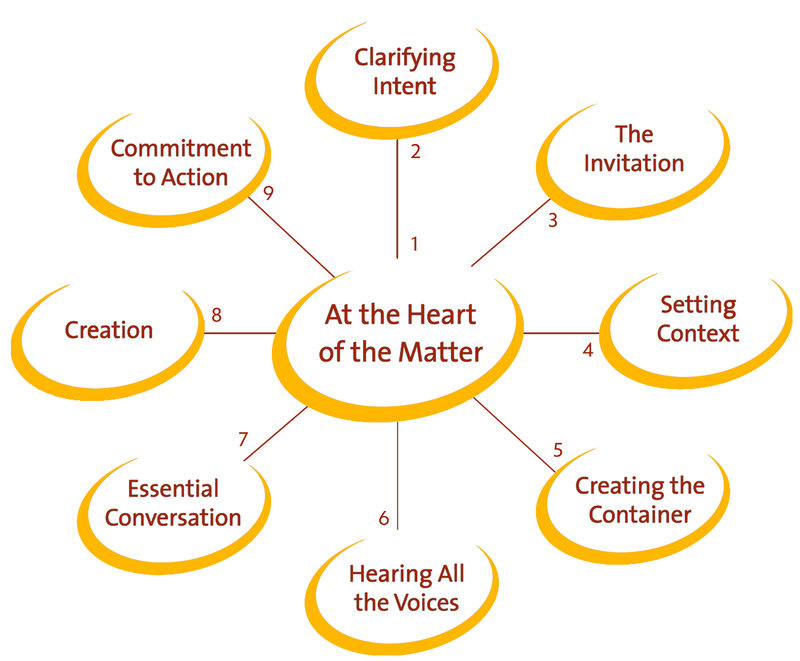 There are nine aspects to the Convening Wheel that take us from the knowledge of ourselves, or The Heart of The Matter (center), to a Commitment to Action (top left) at the close of our gathering - but we don't actually begin to formally interact with others in our gathering until we get to aspect six, Hearing All the Voices - 2/3 of the way around the wheel! That's because what is prominent and important in the Convening Wheel model is the Inner Game of convening. For me, the Inner Game is also the most intriquing and the most challenging part of convening. It is intriguing because of the presence of riches - the riches most of us carry around internally that often remain invisible to ourselves. The exploration of those riches, for me, is exciting and sometimes astounding. The metaphor I like to use when I think about those internal riches is that their discovery yields gold that I can "spend" on my gathering. The Inner Game is challenging to me because this internal exploration requires continual practice or else it tends to depreciate. My internal condition is always changing, so knowing what it was a year ago, or even a week ago, may not yield the gold I want to spend on the gathering at hand. Luckily, the cache of internal riches does not seem to deplete with time, and a good effort almost always yields more than I expect. Some of the Inner Game components covered in the book concern knowing who I am, knowing what I really want for my gathering, bringing myself to genuinely want and welcome each and every participant, and consciously setting the stage for our engagement. The Aspect Strengthening Exercises in the book provide great tools for doing this exploration or finding a place to start. Recently, Craig and Patricia Neal posted an article on the Heartland Circle blog called "The Inner Game of Convening," where they emphasize the continuing need for playing the Inner Game. There are some great excerpts from the book, and a description of how Heartland's Thought Leader Gatherings have used the Convening Wheel model for years, with transformational results. How is the Inner Game meaningful to you? What are some internal exploration practices that you use? If you've read the book, have you found anything to be particularly helpful to your own Inner Game? Please comment to continue the conversation! Your thoughts are valuable. What’s Happening i am new to this, I stumbled upon this I've found It positively useful and it has aided me out loads. I hope to contribute & aid other users like its aided me. Great job.